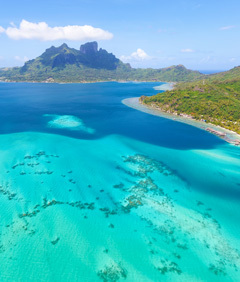 The picturesque islands of the South Pacific are a tropical paradise inhabited by beautiful people and surrounded by unbelievably clear waters – and cruises have made it all more accessible than ever before. Depending on the cruise line, you can either fly directly to one of the islands or cruise from a number accessible departure ports. Cruising through the South Pacific is more cost-effective than land-based travel where hotels, meals and transportation quickly add up. Plus, the entire region is comprised of thousands of islands situated behind protective reefs, so it's perfect for island hopping by ship. Carnival Cruise Lines’ fun and awe-inspiring features are on full display in this great video showcasing their newest ship, Carnival Vista, set to debut May 2016. The virtual tour begins with a view of the atrium and then moves throughout the ship. Norwegian Cruise Line has announced that starting January 2016 and beyond, all guests aboard the Norwegian Sky departing from Miami, FL will enjoy a new all-inclusive experience. Cruises to the Land Down Under are a great way to explore the region's most interesting cities, while also providing access to excursions at sites further inland, including Australia's sprawling Outback. This October, Norwegian Cruise Line will debut the Norwegian Escape, the first in Norwegian's new Breakaway Plus class of ships. The Escape will feature a variety of new amenities, activities and dining venues, many of which are highlighted in our latest infographic. Carnival Cruise Lines and the Maryland Port Administration celebrated the return of the recently renovated Carnival Pride to her new home port in Baltimore, MD. She will be sailing out of Baltimore year-round on 5- to 14-day cruises to Bermuda, Florida, the Caribbean and Bahamas.